Whole and bound PDO Zibello Consortium Spigaroli Culatello. Savor the King of cold cuts selected and guaranteed by the Consortium of Culatello di Zibello. Try some genuine Culatello matured in the cellars of the lower Parma area. Whole and bound PDO Zibello Consortium Spigaroli Culatello. Savor the King of cold cuts selected and guaranteed by the Consortium of Culatello di Zibello. The unique aroma and taste of genuine, traditional Culatello. Culatello is made from the upper part of the pork haunch of pigs farmed in Italy, which is the same used to make Parma Ham. It is hand prepared, salted and spiced. 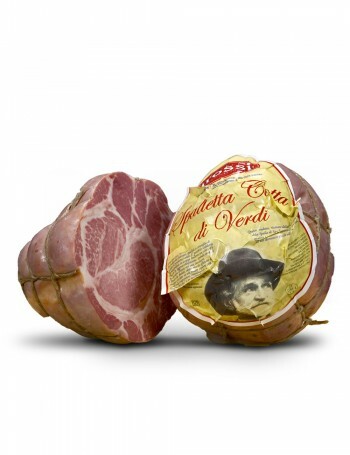 Upon slaughtering, the cut is encased in the pig's bladder, tied and matured for at least 12 months in a humid atmosphere, during winter fogs and sultry summer heat, typical of the climate of the Lower Parma area. This exquisite cold cut remained unknown outside the province of Parma for many years. 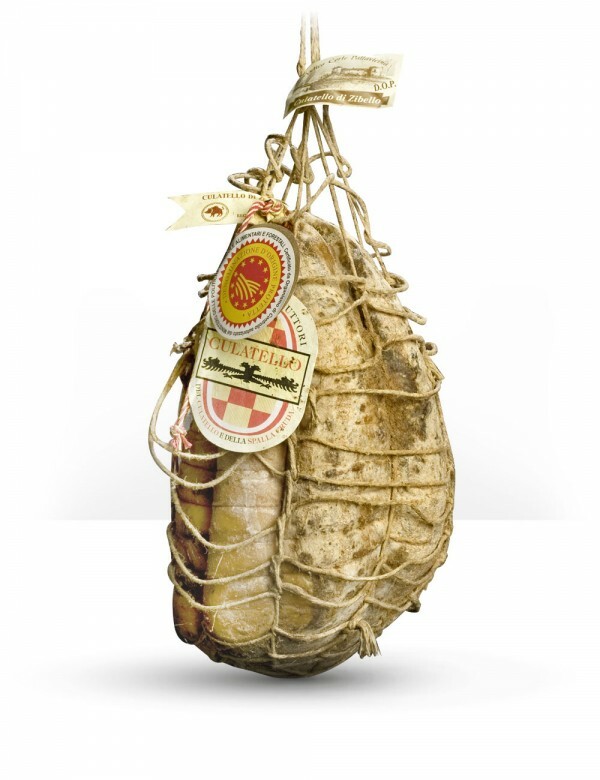 However, in recent times, Culatello di Zibello has been discovered by a wider public and has become a precious, sought after and inimitable product, valued in Italy and throughout the world. A slice of Culatello is uniform pink in color, interspersed with white fat. It has an intense and unique aroma, with notes of musk and rose. It is soft to the palate, with a sweet, full, enveloping and yet delicate taste. When eaten in moderation, Culatello di Zibello is an excellent food as part of a healthy diet. Like other cold cuts, Culatello is an important source of high biological value proteins (19.73g of protein per 100g of product), essential amino acids, iron and zinc. Culatello di Zibello should be hand cut, for more flavorsome slices, rather than using a cutter. Use a medium length and well-sharpened knife. Slices should be paper-thin and it is best to cut it in one direction. All it takes to savor Culatello is some soft bread served garnished with butter curls. For a light and nutritious meal, try serving it with a selection of vegetables with a simple dip and a wholegrain rosetta-a rose-shaped roll. It is best served with a sparkling, medium bodied red, typical of Emilia Romagna: a Lambrusco or Colli di Parma Sauvignon, for example. While on the theme of bubbles, a Millesimato Spumante Metodo Classico is also a suitable accompaniment. The best way to store is to spread a drop of olive oil and a knob of butter onto the cut part. Wrap it in a linen cloth soaked in dry white wine and store in a fresh and dry place, away from odors and preferably not in the refrigerator.